Butterfly Reflections, Ink. 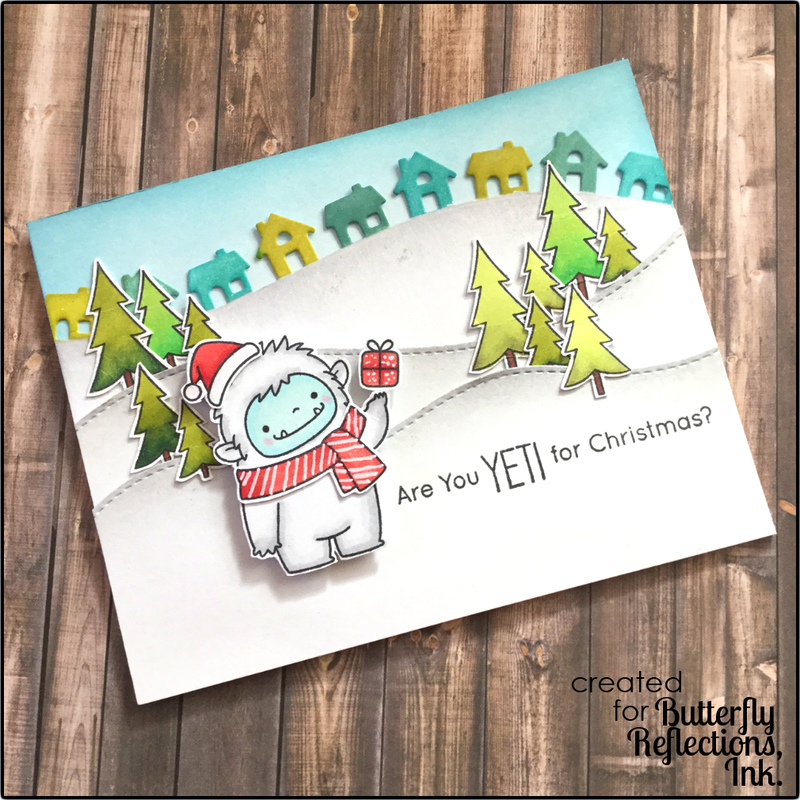 : Are You YETI for Christmas?! 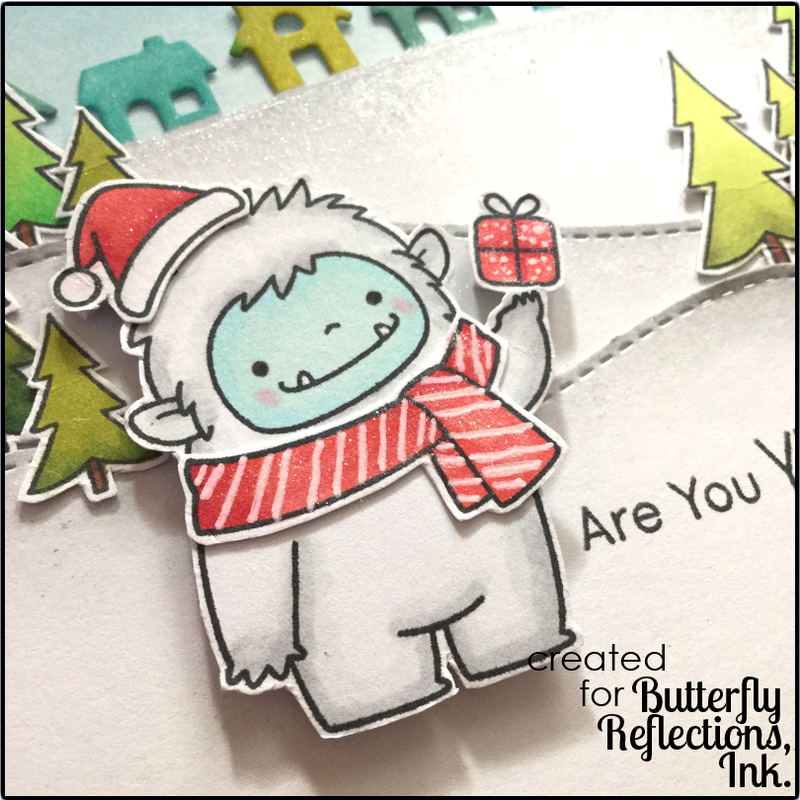 Are You YETI for Christmas?! I am! I'm YETI for Christmas! Haha! Hello! Lynnea here with a card project featuring the new My Favorite Things Beast Friends stamp set. This is a must have for Christmas and everything else! These little Yetis are to DIE for! Let's get started! Remember to head over to the Butterfly Reflections, Ink Shop to pick up any or all of the supplies I've used! Here's my card! I started by stamping out images from the new MFT Beast Friends stamp set using Memento Tuxedo Black ink. I colored them with various Copic markers and cut them out with scissors. Don't worry! If you're not a fussy cutter, the shop has the matching dies in stock HERE. I used the MFT Stitched Snow Drifts Dies to cut out two hills and the Lawn Fawn Little Town Border Die to make a little town in the background. I wanted to give some color to my houses, so I used a blender tool to add three colors of Distress Ink to my houses: Crushed Olive, Evergreen Bough, and Peacock Feathers. I used Tumbled Glass to make a light blue sky and Hickory Smoke to add some shading to my snowdrifts. This card wouldn't be me without some sparkle! And lucky me! I finally caved and bought the Spectrum Noir Clear Overlay Sparkle Pen! It is so sparkly! I couldn't capture all of the sparkle on camera! I used the sparkle pen to blend out the gray Distress Ink on my hills and on the red accents to my Yeti. After adding the sparkle, I added white accents to the scarf and the present using a White Gelly Roll Pen. That's all! I'm so excited for Christmas! It's my favorite time of the year and I can't believe it's a mere 2 months away! Hooray!! Don't forget to pick up all of the things you need for your crafty habit at the Butterfly Reflections, Ink Shop! Have a great day! Great card!! Love the Yeti! I was just curious...do you happen to remember which Copic marker colors you used to color the face and body of your Yeti? Thanks so much!! !